Horror is one particular genre which Malayalam cinema hasn’t explored to its potential. The success of ‘Ezra’ has shown that Malayalee audiences would love to watch horror movies presented in a believable manner. 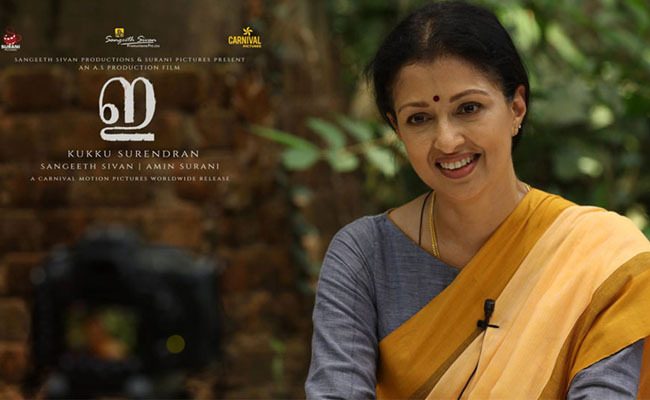 This coming back vehicle of Gautami to Malayalam cinema has all the elements to frighten movie buffs. Coupled with the performance of the debutants, movie tried to mix the experienced hands with that of youthful exuberance. In ‘E’, we have an aspiring filmmaker Karthik (Ashiq Ameer), who is involved with a documentary on the lives of Alzheimer’s patients. As he decides to get into the life of his old music teacher Malathy Menon, ‘E’ actually starts getting into its real plot. Malathy is in an effort to combat the disease with the help of her daughter Athira (Nithya Naresh). Living along with her daughter in a 100 year old house in Haripad, Malathy’s condition, though is in the initial stage, starts giving some puzzling thoughts. Well, things started getting uncoiled as Karthik along with Malathy’s daughter Athira and his friends, sniffing something unusually different in Malathy. The script of Rohan Bajaj and Hari Kumar K, has managed to create a kind of mysteriousness around the character of Malathy. The concept of Alzheimer’s disease added a different dimension to the character. In fact, it is over this very aspect, which ‘E’ is built on. Coupling with her past life, Malathy’s strange experiences have all worked in tandem with the horror mood of ‘E’. However, we are yet to crack the actual intention behind this particular title of this Surendran directorial. Following the movies from Kukku Surendran in the past, we can see that he has managed to provide an improved cinematic experience through ‘E’, though there were some loose ends towards the second half of the movie. We are glad that an actress like Gauthami has made her comeback with such a complex character. She had done a fabulous job as Malathy, whose peculiar mental – physical condition at times edges out the extremely affectionate mother in her. The whole bunch of youngsters did justice to their roles, while the extra comic fillings appeared to be disgusting mostly. Manoj Pillai’s camera works were one factor, which helped the movie to create the required mood of a horror flick, while Rahul Raj’s background music did a decent job to ignite the flame, and we need to applaud him for his effort in recreating the disquieting ritualistic customs. Meanwhile, a lack of co ordination was visible in ‘E’, where we are left with some unanswered questions. Well, call it the cinematic technique from the makers, but still they could have provided a clarity in terms of the connecting links between the past life of Malathy – which happens to be the most important segment of the movie. As we mentioned earlier, movie lost its raciness towards the end and resulted in a below average, and a rather disappointing climax. Anyway, this one was a genuine attempt from Kukku Surendran and co, and we need to appreciate the effort.